For other uses, see Quadrature (disambiguation). In spherical astronomy, quadrature is the configuration of a celestial object in which its elongation is perpendicular to the direction of the Sun. It is applied especially to the position of a superior planet or the Moon at its first and last quarter phases. 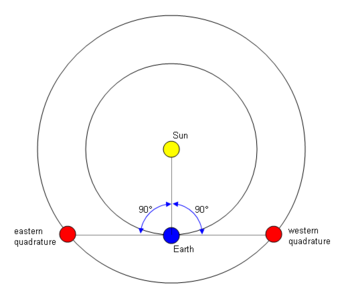 As shown in the diagram above, a planet (or other object) can be at the western quadrature (when it is to the west of the Sun when viewed from the Earth) or at the eastern quadrature (when it is to the east of the Sun when viewed from the Earth). Note that an inferior planet can never be at quadrature to the reference planet. Since the Sun is not infinitely far away, the Moon is slightly past first quarter phase when the Sun and Moon are perpendicular in the sky to each other. This article incorporates text from a publication now in the public domain: Anonymous (1911). "Quadrature" . In Chisholm, Hugh (ed.). Encyclopædia Britannica (11th ed.). Cambridge University Press.